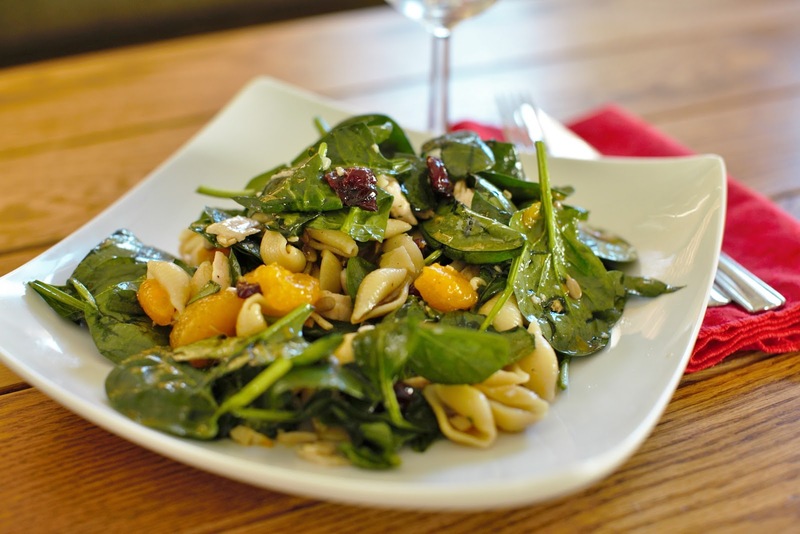 This salad is super tasty with a robust Asian dressing and a mixture of fruits, vegetables and pasta. I even added some shredded cooked chicken to give it some added protein. It was a wonderfully tasty, light and healthy dinner! Cook pasta according to package directions, drain and rinse with cold water. Set aside. 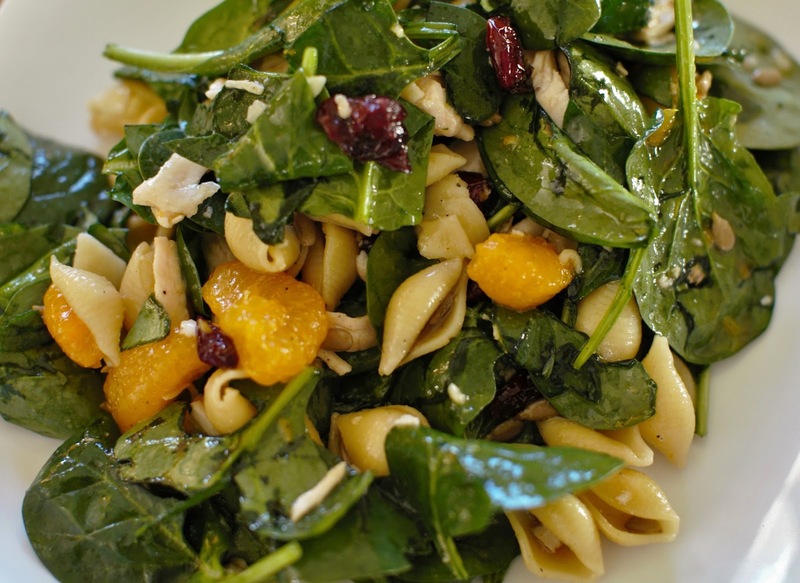 In a large bowl, toss together all of the salad ingredients. Just before serving, pour dressing over salad, toss and serve. Looking forward to leftovers for lunch tomorrow....so good! I've been looking forward to working on this project for some time now.....to see it finished is really gratifying. This is the main wall of my work studio. Since I'm creating an "industrial" feel, I knew I wanted one of the walls to be a brick wall. 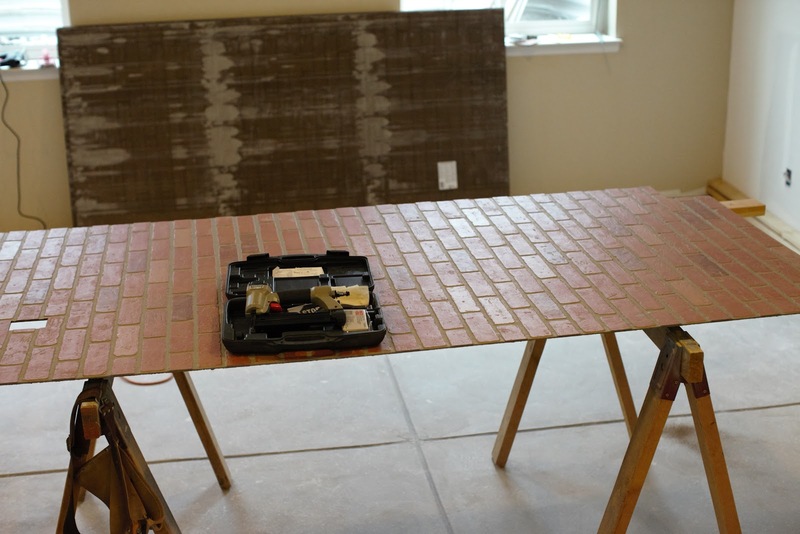 I had looked at a lot of different options to create the look and determined the easiest one was to use the faux brick panels you can purchase at Home Depot or Lowes. We opted for the Home Depot just a couple miles from us; we needed a total of 7 (6 and a partial) panels. My husband managed the panels on his own. Fortunately, most of the panels could be nailed up without any cuts. We have two outlets and a soffit covering the main beam on that wall, which created the need for a shorter panel and two openings for the outlets. I chose the panels with red brick and grey grout lines. 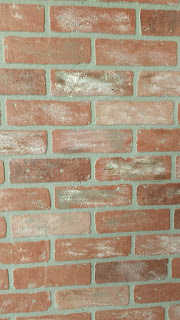 They also have an option of red brick with black grout, but that didn't look very authentic to me. I don't know that I've ever seen a brick wall or building with black grout? My job was the painting. 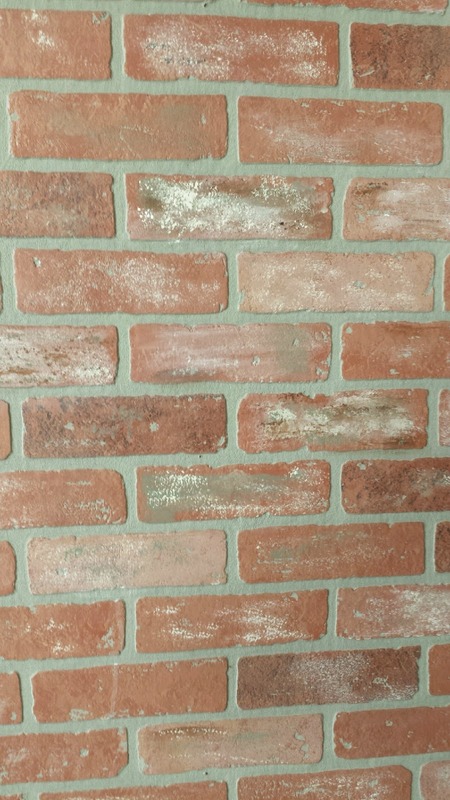 I took the time after the panels were in place, to add some texture/color to the bricks. They were a little too "perfect". I wanted them to have variegated color like true brick, so I added some beige, brown, and sage green. The beige is actually the wall paint color and brown and sage green are my accent colors. It took me some time to find the right technique. I used a blotting technique with a paint brush (completely ruining the brush by the end of the process!) which created the look I wanted. I placed the tip into the paint, then wiped it on a piece of paper towel to remove the excess, then dabbed the brush on the brick, very similar to the dobbing technique when stencilling. I also went back and caulked the seam lines and painted over them to try to camouflage them a bit better....you couldn't see them from about 15 feet away, but the minute you walked closer to the wall you could see them, and it really bothered me. 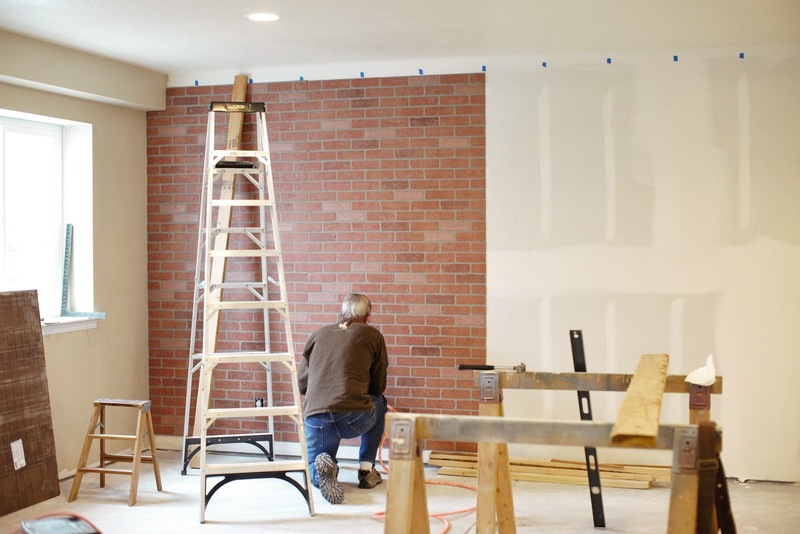 Both the top and the bottom of the wall will have a wide white trim/moulding (you can actually see the top piece is in place in the picture above) as finishing. Next up is the floor. We're attempting something else we've never done before and that's a "painted" concrete floor. It should be just the right look. Throw down a couple of area rugs here and there and it should be great! I'll share some pics of that project in the near future. 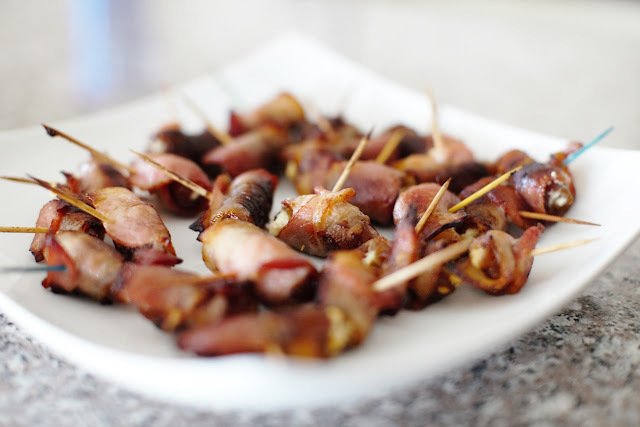 I was first introduced to these hors d'oeurves a few weeks ago at a wedding. They were tucked away on a table with a few other appetizers that were served during cocktail hour. 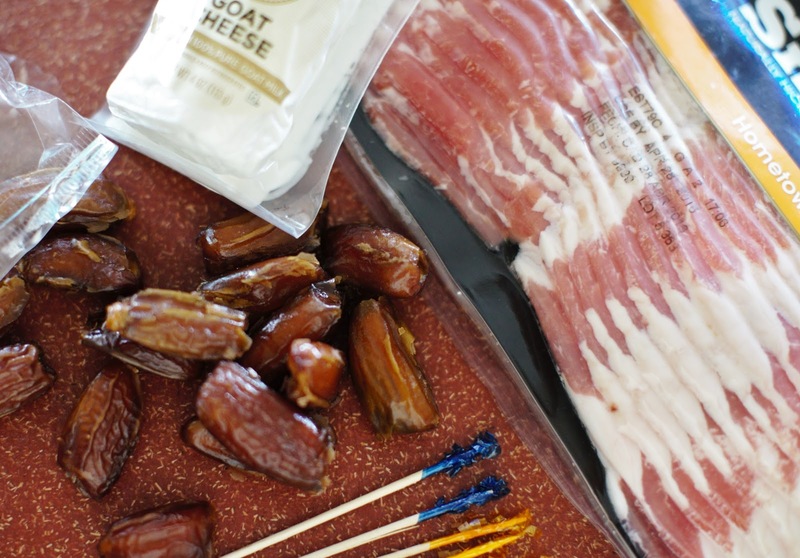 Later that evening I asked the coordinator what they were and was shocked when she told me it was a date stuffed with goat cheese wrapped in bacon. They were absolutely delicious! I had never tasted anything like it. A few days later I started looking for recipes, not thinking I would find anything, but to my surprise there were several out there. Since that time, I've made them twice. 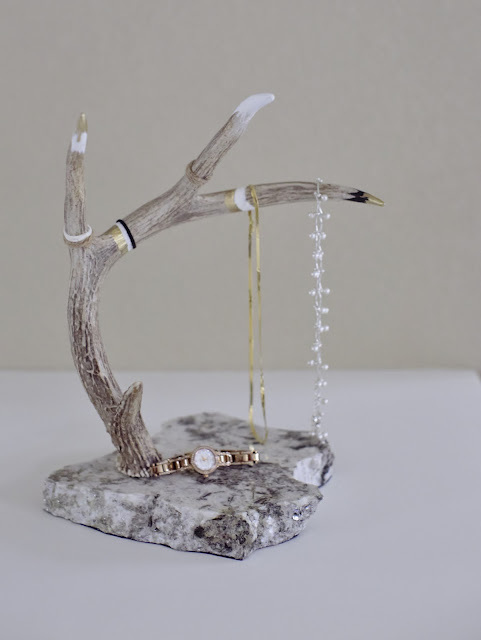 Once for a dinner party and the other for Super Bowl Sunday. I learned after the first time to cook them a bit longer, and stuff them a bit fuller and they were fabulous. In fact, they're downright addictive! What's even better....you can make them ahead of time and then pop them in the oven about 20 minutes before you're ready to serve them. 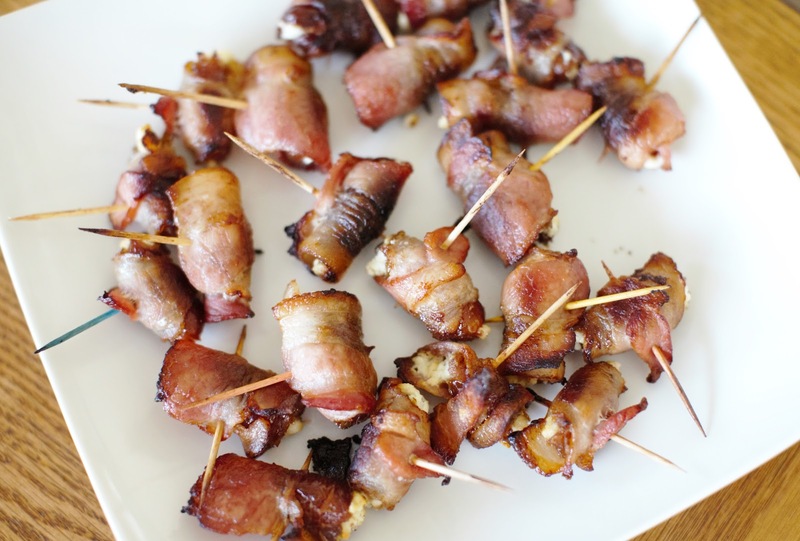 Cut a strip of bacon in thirds. Slice the date lengthwise. Add a small dollop of cheese to the date; close tightly and wrap with bacon securing with a wooden toothpick. Bake for ten minutes. Flip the dates over and continue to cook for another ten minutes. 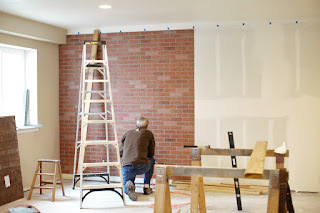 I had been exploring the idea of an accent wall in my office for some time, scouring online posts and Pinterest for some of the creative solutions others had come up with for their own homes. I came across the look of a wall with all-over bold stencils done with tone-on-tone paint and kept coming back to it. It was beautiful and subtle at the same time. Something I could live with for a long time. I wasn't disappointed. In fact, I am in love with the final result. When you come down the stairs it catches your attention. A true statement wall. 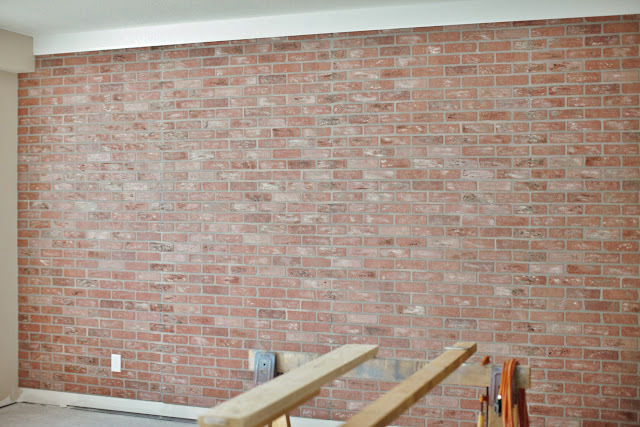 Timing allowed me to tell the contractors not to texture that wall since I knew from previous experience that stenciling a textured wall is tough and the results are less than perfect. I found the stencil at Royal Designs Studio. 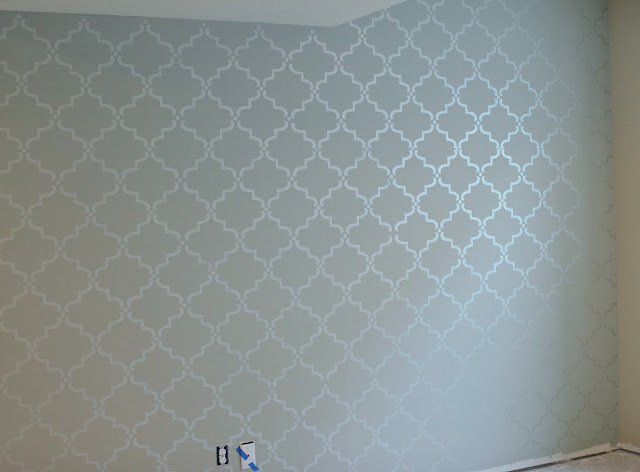 I wanted a large pattern, simple in design, but bold in how it would transform the wall. 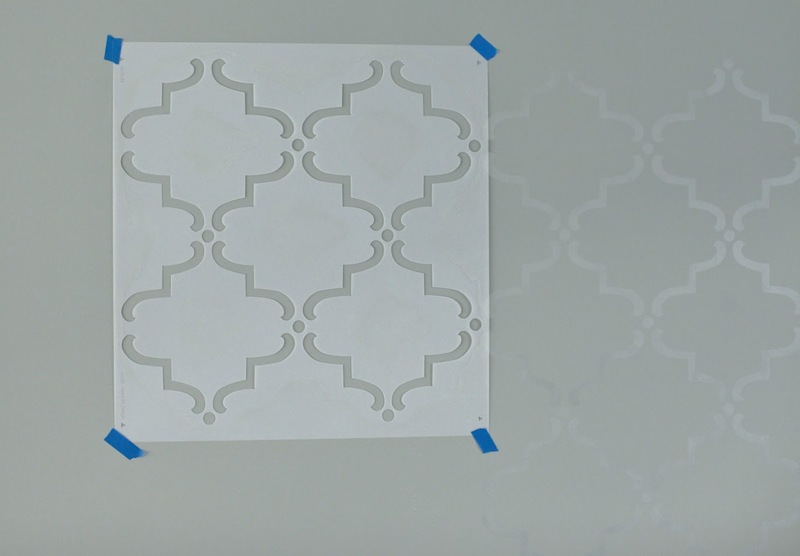 This Moroccan style stencil was just the ticket! They have an extensive selection of stencils, and tools. They also have some awesome videos and blogs on tips and tricks. 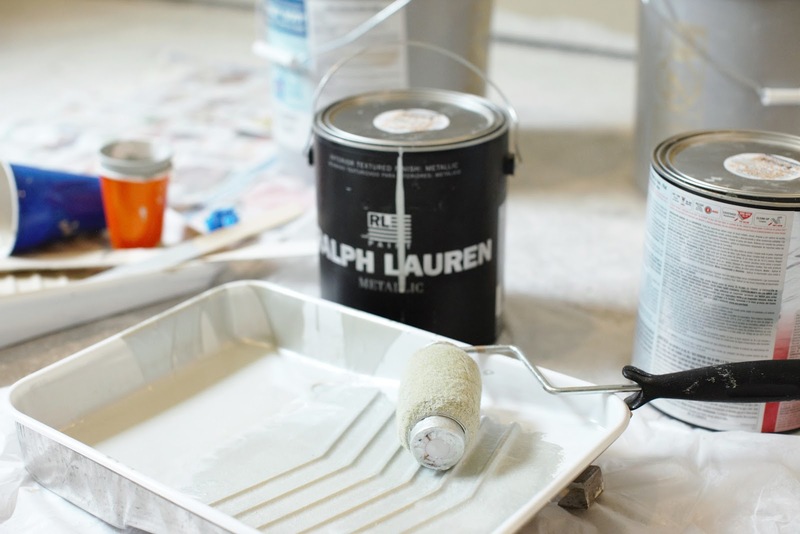 I was glad I took the time to watch one since it helped me with the technique of loading the roller with paint and "off-loading" before I applied the paint to the stencil. I learned they key is having very little paint on the roller. It worked like a charm. 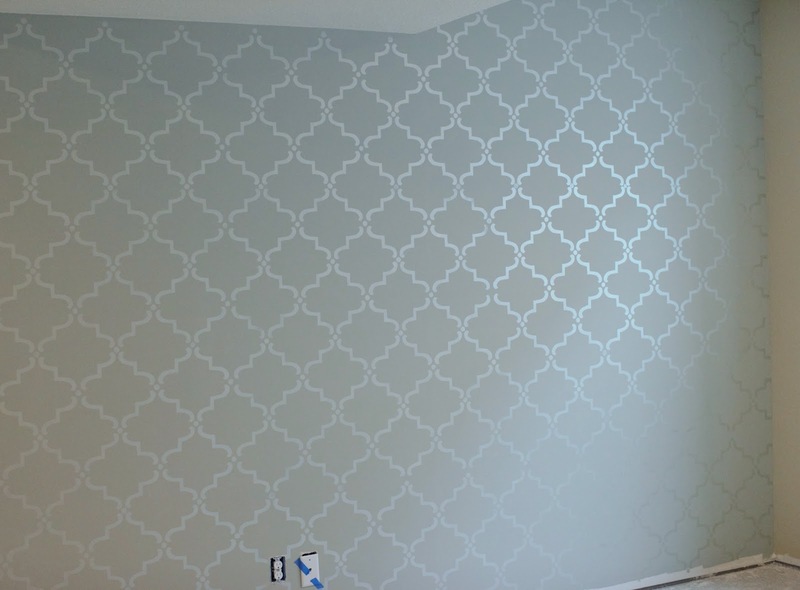 My husband painted the wall with the flat paint, and I did the stenciling. I did it over the course of several days, in between other projects. The total amount of time I would estimate at about 4 hours. That includes cleaning the stencil and touching up any "bleed through" (which was very minor) after the fact. I also found the blue tape sometimes pulled the flat paint off the wall. Kind of curious that it did so, but easily remedied with a small brush and a cup of the flat paint. As with any wall, there were a few challenging spots along the way. 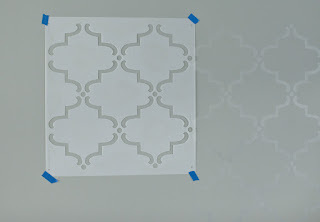 Based upon the repeat pattern, those areas which required only a "partial" stencil were awkward to tape and press and roll all at the same time. But all-in-all, it went well...better than I expected actually. I can't wait to see what my office looks like with the furniture in its place and some artwork on my beautiful new accent wall! We can see the light at the end of the tunnel now....the contractors are just about finished, which leaves us with the floor and trim work before we can begin "moving in".